Making your own alcohol at home sounds like fun, but it's a long, complicated, and sometimes expensive process. You need all sorts of equipment, and by the time you're finished, it's been a few weeks—even months. If you want to try home-brewing without all the hassle, one of the most painless ways to do it is to start with fruit juice. Claire Lower over on xoJane tried this method using two different types of yeast powder to see which one produced the highest alcohol content. Here's how to try it yourself. You can use any kind of juice you like, but it has to be 100% fruit juice with no preservatives, and preferably at least 20 grams of sugar per serving. 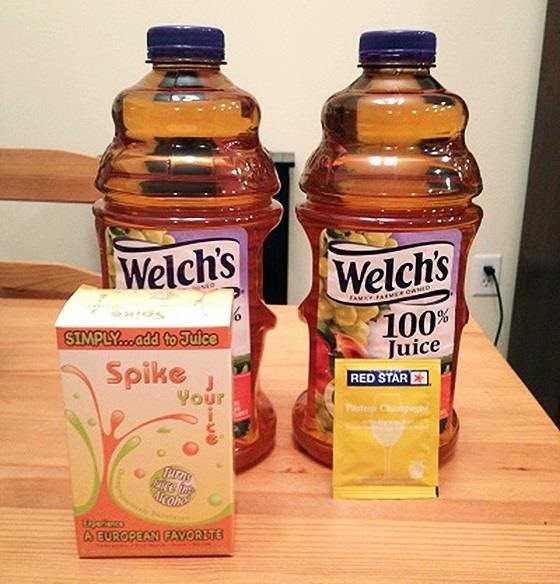 Claire used a product called Spike Your Juice, which is a yeast powder kit that includes an airlock, and a generic packet of champagne yeast from a home-brew supply store. Since the Spike Your Juice powder was divided into 1-gram packets, Claire used a kitchen scale to measure out a gram of the champagne yeast to create an accurate comparison. You can use more or less, depending on how high a percentage of alcohol you want. 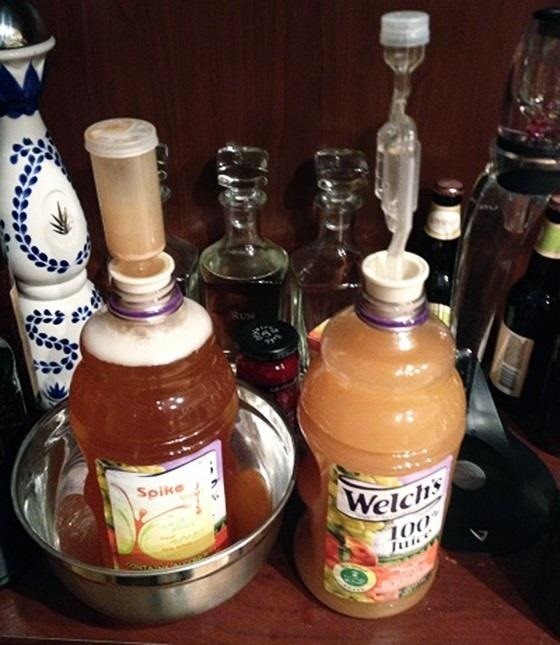 Pour the yeast powder into your bottle of juice and screw on the airlock. Now, just let it sit for a few days. It'll bubble up when it's fermenting. If any juice gets into the airlock while it's fermenting, take it off and rinse it, then put it back on. You can pour a little juice off the top if it foams up too much. You can find more photos and details on the differences between the two bottles over on Claire's tutorial. If you're interested in learning more about home brewing, be sure to check out some of our other articles, or maybe even try your hands at some prison pruno (aka hooch). How To: Citrus Fruit… Your New Favorite Facial Cleanser? I've been doing this for a couple years now. Use Champagne yeast, Lavlin-V1116 from Amazon. Use ~ 1/8 tsp yeast. If you want to boost the alcohol content, drink some juice and add a cup of sugar. Give it 4 or 5 days, and you'll have a passable wine at low cost and some good punch. Welch's Red and regular grape juice are most reliable picks. When making homemade wine a.k.a. hooch yeast is not needed. All you need is juice, sugar and water. The wine is ready in 3 days but if you've added a ton of sugar you can let it sit up to 7 days tops. Remember the more sugar you add the sweeter it will be. 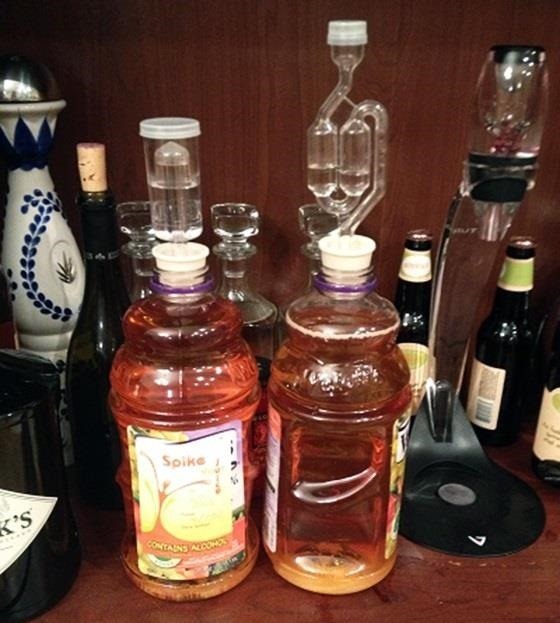 I never heard of anyone adding yeast to make homemade wine with fruit juice. Yeast is used to help break starches down into sugar. Fruit juice is already sugar and has no starches. I like using a pound of sugar per gallon of water. 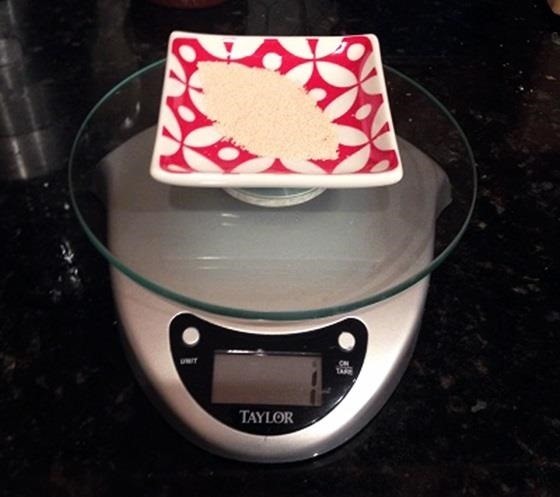 My friend uses 4 pounds of sugar per 5 gallons of water. The more sugar the longer it ferments, sweeter it is and the higher the alcohol yield. I found a biology site that says yeast first turns starches into simple sugars and then enzymes in the yeast turn those sugars into ethyl alcohol.Adding sugar will increase the yield.I could not find an explaination for sugar and water alone fermenting into alcohol except for the presence of anerobic or airborne fungi(a.k.a. yeast).These single-cell organisms exist freely and in great abundance in earths atmosphere and most likely in the air surrounding your sugar grains when you introduce them into water.It is the whitish haze you find on grapes .I find it hard to believe that you have never heard of adding yeast to juice...considering that is what this site and many others your search engine provide, all explain.Have you ever wondered how wine is made?Hopefully your juice is not raw or you could be growing other things in there. Does the airlock come with the needed bung or would you need to get one of those as well? ... "Claire used a product called Spike Your Juice, which is a yeast powder kit that includes an airlock, and a generic packet of champagne yeast from a home-brew supply store." Or you can pick one up for a couple bucks at your local brewing supply store. What about methanol being present in this. How do we make sure this is safe to drink with zero or low methanol presence? You really don't have to worry as these instructions are simply for fermentation (using a very similar process to home-brewing beer). As long as you don't distil the beverage after fermentation (aka: don't take it farther than instructed to here in this article), the methanol (while present) will be at a low (safe) level. People have been doing this for years. That said, if you want to distil your booze after fermentation, you'll need to make sure you really know what you're doing as this can drastically increase the methanol levels if you don't know how to properly extract it (too much methanol can make you go blind). There are no worries regarding Methanol when using such a process. All beverages that contain alcohol like beer, wine and Distilled Spirits contain Methanol. However when Distilling it is important to extract the heads or foreshot before proceeding to the heart which is the best and most pure alcohol. You will be fine. Even Freeze distilling without heat is appropriate where legal without worrying about Methanol. The Scotts and Germans use many of thier beers to commercially freeze distill thier high abv beers. Methanol in a cosentrated dose will make you go bilnd cause vision damage or even death. Best to leave it to the pros or spend about 5 or more years perfecting your craft. So just curious, how much was the final alcohol content for your fruit juice? Do you use a cork? With the airlock or what is it connected to because it does not look the bottle cap or part of the airlock?